New 126,000 square foot tilt-up panel office/warehouse. New 43,800 square foot tilt-up panel warehouse building built as a spec space. New 14,000 square foot tilt-up panel office/warehouse. New 5,600 square foot tilt-up panel warehouse building built as spec space. This 29,500 square foot addition was designed with a steel framed roof to be independent from the existing building. The exterior walls are tilt-up concrete panels which were load bearing as well as providing the lateral stability for the building. New openings created in existing panels included a 40' opening that required a structural steel system capable of holding up the existing panels and roof without significantly impacting the existing operations. This steel slitting plant was constructed in three phases with the total square footage being 120,000 square feet. The building structure was a pre-engineered building with fixed base columns supporting multiple cranes up to 50 ton, class E. PEI provided the design of all building foundation systems. This included not only the building footings and truck docks but also a slab designed for 1,500 psf, foundations for train rail lines through the building, equipment foundations including slitting pits, and an underground conveyor tunnel. 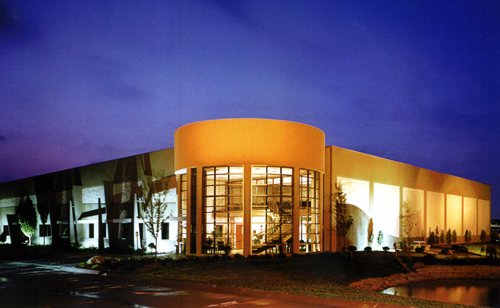 New 30,000 square foot office/warehouse in 2001 with tilt-up walls. Provided a 30,000 square foot expansion in 2011 using precast panels. New 37,000 square foot tilt-up panel office/warehouse. New 20,000 square foot warehouse with an underhung bridge crane. Roof framing is comprised of steel bar joists and girders which are designed to support the bridge crane. The exterior walls are tilt-up panels that act as lateral stability elements as well as carrying the perimeter roof. This 42,000 square foot warehouse and lower 12,500 square foot attached office building was framed with steel joists and joist girders. The exterior walls are tilt-up concrete panels which were load bearing as well as providing the lateral stability. This 46,800 square foot pre-engineered warehouse and office building had several foundation challenges. The slab was designed for heavy steel storage and had embedments for a gantry crane running through the main warehouse area. In the office, stepped foundations and slabs were used to create multiple floor levels as required at training and office areas. This 41,500 square foot building houses the owner's concrete construction business. To showcase the owner's capabilities, the structure includes a curved monolithic cast-in-place concrete stair, a waffle slab mezzanine, and tilt-up concrete walls. The tilt-up walls include architectural "fins" protruding from the building and radiused panels at the circular building entry. This 84,000 square foot warehouse was an addition to the existing facility at this location. The exterior walls are tilt-up concrete panels which are load bearing as well as providing the lateral stability.